Circular knitting is a technique that reduces purling and produces garments with fewer seams. You can choose from differenty types of needles, but some types of yarn are better suited to circular knitting projects than others are. You use two types of needles in circular knitting: double-pointed and circular. Although some types of projects are more easily worked using certain needles, the needle you choose is largely a matter of personal preference. Double-pointed needles: Double-pointed needles, commonly called dpns, are straight needles that are pointed on both ends. They are good for working on projects with a small circumference, such as mittens, socks, or the fingers of gloves. You divide your stitches among the needles (sold in sets of four or five) and work in a continuous spiral from one needle to the next, forming a tube of knitted fabric. Double-pointed needles are available in all standard needle sizes ranging from tiny 8/0 (pronounced “eight-aught”) to very large US 36 (20mm). Sold in lengths ranging from 4 to 16 inches, dpns are most commonly found in 5- to 8-inch lengths. Varieties are made of plastic, aluminum, steel, bamboo, and various types of wood. Circular Needles: A circular needle consists of two needle tips connected by a thin cable. You typically use circulars to knit projects that have a circumference of 18 or more inches. However, you can use them in creative ways to knit smaller circumferences. Circular needles are available in all standard sizes. However, they are not easy to find in sizes smaller than US 0 or larger than US 19. Circular needles come in lengths ranging from 9 to 60 inches. This measurement includes the length of the needles, not just the length of the cable. The length of the needle tip varies with the length of the entire circular needle. The point where the needle and cable meet is referred to as the join. A smooth join is important, because it means your stitches won’t snag as you slide them from the cable onto the needles. Metal and polished wood needles are slick and smooth, which means that stitches slide faster along the needle. Bamboo, plastic, and unpolished wood needles have more texture and drag to help your stitches stay in place. These can be a better choice for beginning. Although Skacel Addi circulars cost more, their quality is well worth the investment. The join on Addi circular needles is barely noticeable, and they have a pliable cable. They come in three types: Addi Natura, Addi Turbo, and Addi Lace. 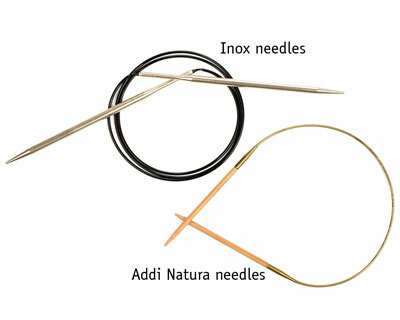 Addi Natura needles are made of bamboo with a moderately blunt needle tip and are excellent beginner needles. Addi Turbos are made of nickel-plated brass and are very smooth and fast. 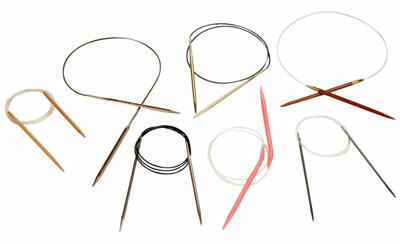 Addi Lace needles are made of polished brass and have a pointy tip that is perfect for working lace or cable projects. Inox makes two types of circular needles: Inox and Inox Express. Both are affordable. 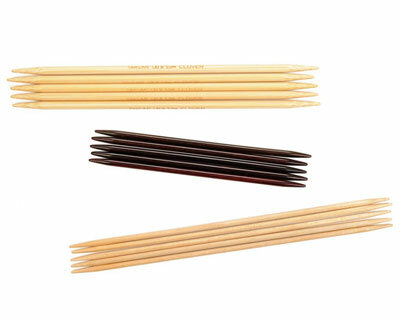 Clover Takumi bamboo circular needles are affordably priced and, because they are made of bamboo, are excellent needles for a beginning circular knitter. A worsted-weight yarn: Its size makes it perfect for learning new techniques. Thinner yarns can be fiddly and difficult to manipulate; thicker yarns can obscure stitches. A smooth yarn: It is very important when learning a new technique to be able to see your stitches clearly. Any yarn that obscures your stitches is not a good choice. A three- or four-ply yarn: This type of yarn has the kind of stability you need when learning. A wool yarn: Wool is elastic, which makes it forgiving of a beginner’s uneven tension. Also, wool’s durability allows you to rip it out and reknit it multiple times. A light-colored yarn: Darker colors absorb the light around them and can make it difficult to see the details of your stitches. Lighter colors reflect light back to your eye. White can be too bright, but a light neutral color, such as natural or tan, is excellent, as are pastels. 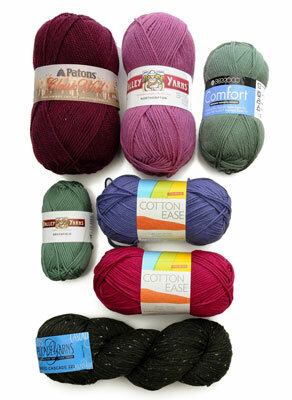 Some yarns to consider include Cascade 220, Valley Yarns Northampton, Lion Wool, and Patons Classic Wool. If you have a wool allergy, then consider a good-quality acrylic or acrylic blend, such as Berroco Comfort, Lion Cotton-Ease, or Patons Canadiana.